We had our first look at the opening night party at STK last month. But we were hoping to get to see what the dining experience was like. So last night they generously invited us back for a special complimentary dinner. This wasn’t just a typical dinner. It was a carefully planned out dining experience that allowed us to try their signature dishes, cocktails and desserts as well as meet and talk with the restaurant manager and the chef, James O’Donnell. It’s nice to see a restaurant of this caliber putting a priority on local media and bloggers. The fact that they treated us so well impressed me regardless of how the food was. If you want the detailed review read on, if you want a summary of essential information, skip to the bottom. That being said, let’s talk about the food. And the atmosphere. But mostly the food. 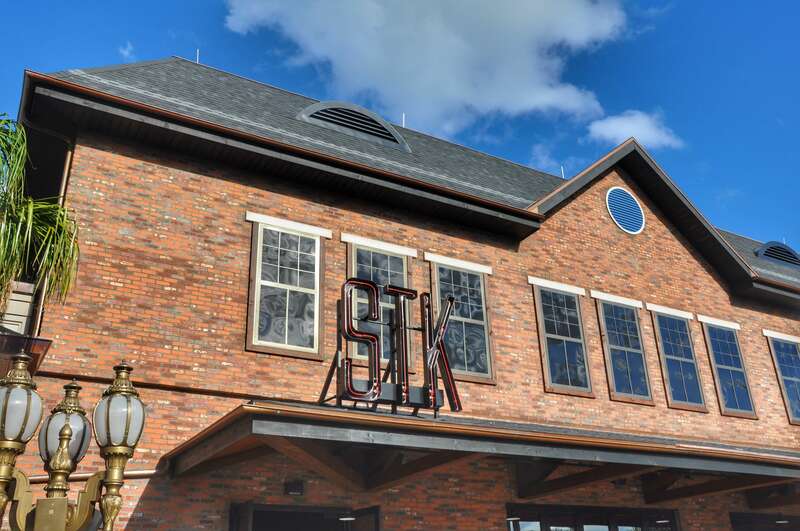 STK has many locations in large cities all over the US. Their Orlando location opened May, 2016. It’s located in Disney Springs near Raglan Road and Morimoto Asia. This central location means you can get to it easily from the new Town Center shopping area. 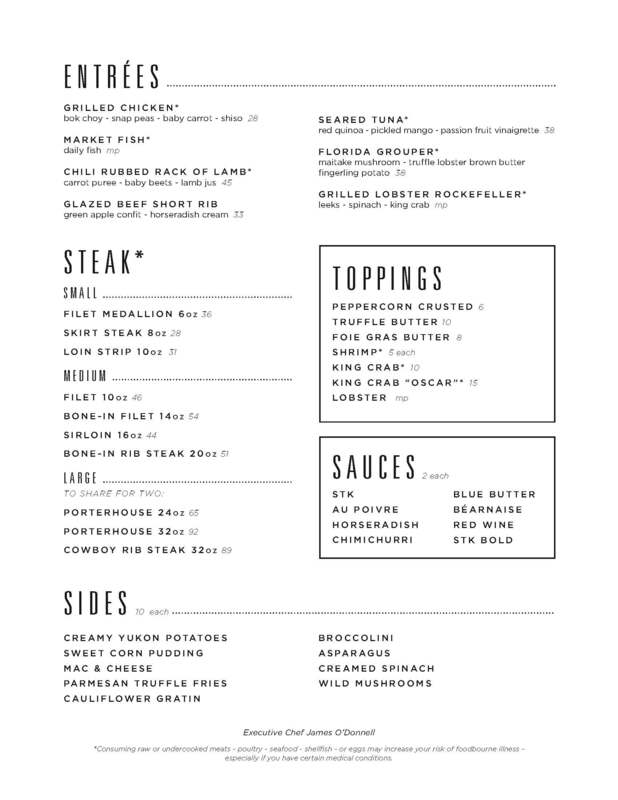 STK stands for steak. And that is their specialty. However, this ain’t your fathers steakhouse. You will see that immediately. From the full time DJ spinning upbeat dance tunes, to the urban chic decor the vibe here is modern, fun and decidedly upscale. Do you guys remember Pleasure Island? Yeah we’re going way back here. Back when Pleasure Island was the place to be, there were dance clubs and bars all over Downtown Disney. They got away from that a long time ago, and Universal was more than happy to take their place when they built Citiwalk. If you took the younger, fun vibe of Citiwalk, and combined it with the upscale dining of, say, California Grill, that will give you a good idea of what you can expect at STK. Don’t let the DJ fool you- this is a fine-dining restaurant. The food (and the prices) will reflect that. There’s two levels of seating plus an open rooftop area. You can be seated in several different areas, each with a slightly different feel. The front area near the bar is called The Bistro, and there is an outdoor seating area in front of the restaurant. Going upstairs there’s another dining area with a slightly more casual vibe, and then you have the open rooftop. They also have several rooms and terrace areas available for private events. They have two full bars in the restaurant, with several signature cocktail choices. I tried the Orlando Pride, a special drink with proceeds to go to support the One Orlando fund. Every meal at STK starts with bread. Not just any bread, but the most amazing pull apart soft bread with blue cheese butter drizzled on it. I don’t even like blue cheese. Yeah. It was that good. Can I just have bread for dinner? Thanks. Appetizers were next and all three were great. The most surprising one was the Grilled Octopus. It’s not something I would have ordered but I ended up really liking it. If you like scallops, it had a similar texture. Since then I’ve been thinking about it I will go back and order it again for sure. You should definitely give a try. Be a little adventurous! The main course was a selection of choices I opted for steak since that’s what STK is known for. I chose the filet. The sides are separately ordered and have enough for several people to share. I loved the Macaroni and Cheese, all though to be honest, there aren’t too many mac’n’cheese in existence that I wouldn’t like. So, the steak. It was fantastic. Exactly what I would expect from high-end steak restaurant. Cooked perfectly and not overly seasoned which I like. I feel that if the meat is very good quality you don’t need to drown it in spices. You can choose one sauce to accompany your steak. They brought us all of them so we could sample them. But I found that my favorite was the one I would have ordered, the Bearnaise sauce. I would say the steak was on par with someplace like Ruth Chris’ Steakhouse if you’re familiar with that. And now my favorite part of the meal, dessert. They brought us the Carmalita, Orange Dream Cheesecake, and Bag O’ Donuts. The Carmelita was my favorite, all though it only beat the cheesecake by a tiny bit. The Carmelita is lighter than it looks, with this incredible marshmallow layer with chocolate ganache- so so good. The other is like a Dreamcicle cheesecake, light fluffy and yummy. The donuts were good but nothing real special. Definitely go with the other choices. Desserts are $10 each. The real star of STK, aside from the food is the rooftop terrace. With the giant STK light up sign to the gorgeous panoramic views of the Town Center area, its hands down the best place in Disney Springs. Even on warm summer nights there’s a nice breeze up there, and there’s a big fire pit for cooler months. Taking your picture in front of the giant neon sign is pretty much required. It will become an iconic picture spot. 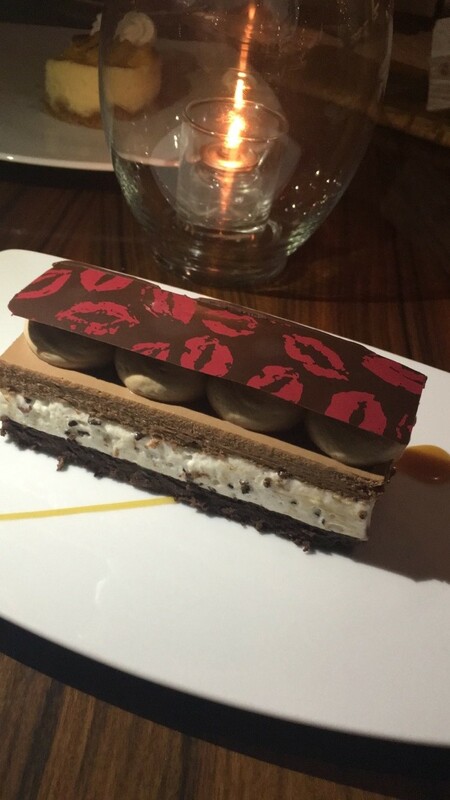 STK Orlando is a great fine-dining addition to Disney World. It’s a place to go to feel posh and trendy, to see and be seen. When you want an upbeat atmosphere without a club scene, and you want a fantastic meal that won’t feel rushed. You’ll see less “theme park” clothing, and a little more evening out attire. It’d make a perfect place for a girl’s night as well as a celebration evening with friends and family. It’s price range is on par with California Grill, Shula Steakhouse, and similar fine dining restaurants on property. Salads are around $15, starters are around $20. Most entrees are in the $30-50 range and desserts are $10 each. I’d order the octopus if you’re feeling adventurous, your choice of the steaks, and either the Orange Dream Cheesecake or the Carmalita. Or both. I won’t judge. Make your way to the rooftop bar for after dinner drinks and take a few photos. You’d have the makings of a very special evening. If you try STK let me know what you thought. Special thanks to my dear friend John (BigFatPandaShow) for inviting me. New Castle Show: Mickey’s Royal Friendship Faire Is Here!